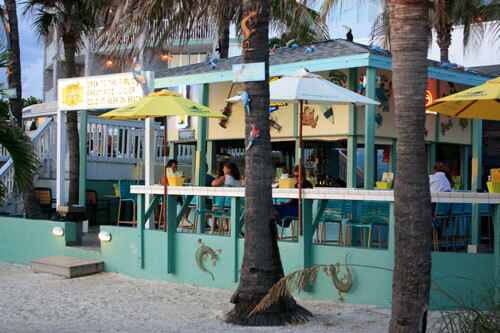 Bongo Bongos Beach Bar on St Pete Beach is a place to visit on your Florida beach vacation. 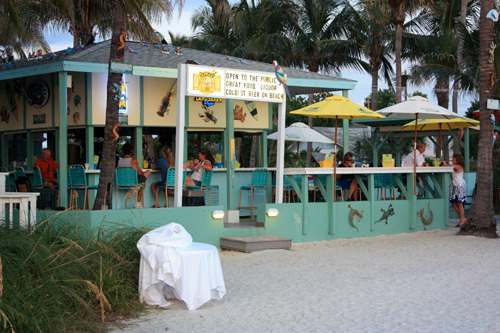 Located on the Miracle Mile along Gulf Blvd, it is a bar hopping destination in "Party Town." Locals and visitors alike enjoy this little beach bar connected to the backside of the Grand Plaza Hotel. We've been here several times and have always enjoyed ourselves. The food is good, there is a decent selection, and it doesn't cost very much. Although we ate here before going dancing at Carl's Piano Bar over on Corey Avenue, and were dressed nice, but casual...we saw several women in evening gowns as well as a few guys who had just waded in from their fishing boat. It is best to get a seat over on the west side or the north side...otherwise, you'll have a stunning view of the blacktop parking lot. There is live music on most weekends, but it would be smart to call first (727-360-1811 ) if that is what you are looking for just to make sure something is scheduled. Bongo Bongos may be high-energy on Friday and Saturday night, but during the week, it is a nice place to meet friends or hangout to watch a beautiful Florida beach sunset. Don't be surprised to see a Florida beach wedding taking place just beyond the deck. 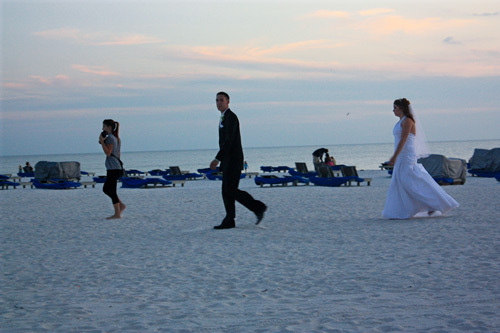 Young couples love the natural setting and the low cost of getting married on St Pete Beach. The times we were here at Bongo Bongos Beach Bar, the band stopped playing and people in the bar were quiet and respectful as the couple said their vows about 50 yards away. Just to show you the diversity you'll find at Bongo Bongos, there are visitors in shorts viewing the couple headed out to their wedding, while a woman in a dress (between the trees) reads a novel as she sips a beer and waits for sunset. Bongo Bongos Beach Bar is a unique place to visit on your Florida beach vacation. It has a little something for everyone. I hope you have as much fun as we do here.